In this talk I look fifty years into the future of materials science to assess the possible technical advances and their impact on engineering, society and culture. My central thesis is that materials development has historically been driven by human needs and desires, and this is likely to continue into the future. Themes such as self-healing cities, energy harvesting, synthetic food and creating super humans are explored in terms of their materials requirement needs and our likelihood of achieving them. Possible directions for materials science are explored such as meta-materials and technical textiles and their potential impact on human expression in design, fashion and architecture. Finally, as the number of materials increases, I assess the likelihood that the methodology of materials development itself may evolve. Will theory continue to dominate, or will approaches that combine big data and combinatorics become more important forms of materials discovery? Or, more controversially, will our 10,000 year old track record of materials innovation come to an end, as we run out of new materials to invent? 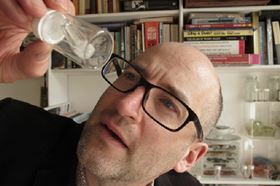 Professor Mark Miodownik is the UCL Professor of Materials & Society. He received his Ph.D in turbine jet engine alloys from Oxford University, and has worked as a materials engineer in the USA, Ireland and the UK. For more than ten years he has championed materials research that links the arts and humanities to medicine, engineering and materials science. This culminated in the establishment of the UCL Institute of Making where he is Director and runs the research programme (www.instituteofmaking.org.uk). Prof Miodownik is a well known author and broadcaster. He regularly presents BBC TV programmes on engineering which have reached millions of viewers in more than 200 countries. In 2013 he was awarded the Royal Academy of Engineering Rooke Medal, and he was elected a fellow of the Royal Academy of Engineering in 2014. He is author of Stuff Matters, a New York Times Best Selling book, which won the Royal Society Winton Prize in 2014 and the US National Academies Communication Award in 2015.In 2016 he was awarded the American Association for the Advancement of Science Prize for Public Engagement with Science.